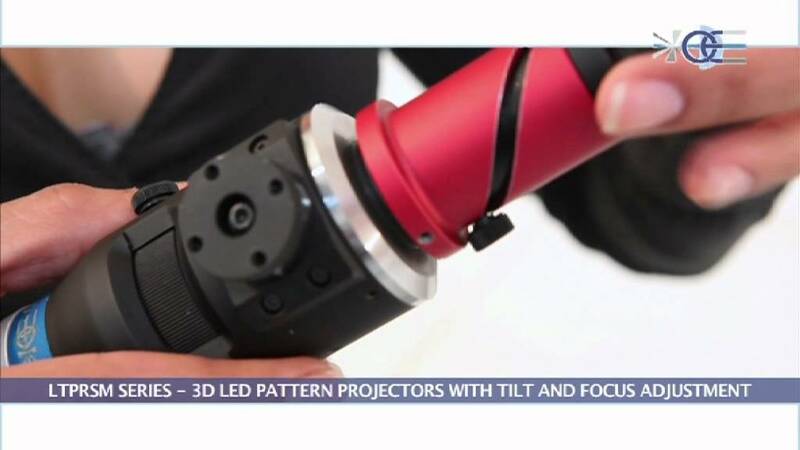 The Opto Engineering LT PR SM are LED pattern projectors specifically designed for the most demanding 3D profiling and measurement applications. Triangulation techniques require that structured light be directed onto a sample at a considerable angle from vertical. Tilting the light source pattern becomes essential to ensure that patterned light is properly and homogeneously focused across the entire sample surface. The Opto Engineering LT PR SM pattern projectors integrate a precision tilting mechanism based on the Scheimpflug criterion. This also ensures that the focus does not change when the pattern is tilted. Moreover, the internal focus mechanism offers the maximum optical throughput. The projected light path is effectively coupled to the pupil aperture of any C mount lens. The projection pattern inside the unit can be changed and integrated with ease: just remove the C-mount adaptor by loosening the set-screws and fix the pattern by screwing the retaining ring. The Opto Engineering LT PR SM units can be interfaced with any type of optics, but the best results are achieved with bi-telecentric lenses. The projection area is undistorted since tilting the pattern only causes a linear extension along one direction. Very good results can also be obtained with zero distortion macro lenses; here, the magnification changes along both axes, but image resolution and distortion are such that 3D reconstruction can still be easily performed. With non bi-telecentric lenses, a square pattern becomes a trapezoid in the projection plane.